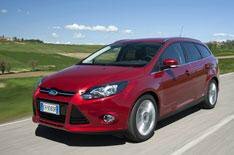 Ford Focus Estate on sale this month | What Car? The all-new Ford Focus Estate will go on sale later this month. Final prices have yet to be confirmed, but the estate is likely to cost around 16,995. It will have the same engines as the five-door hatch. With the rear seats raised, the Focus has 476 litres of luggage space 24 litres less than the Vauxhall Astra Sports Tourer and 29 litres less than the Volkswagen Golf Estate. The 60/40 split rear seats fold down to expand carrying capacity to 1502 litres, a figure that beats the Golf by seven litres, but still trails the Astra by 48 litres. Reworked suspension means the loadbay is as low as possible, and at 1149mm wide, it's 119mm wider between the wheelarches than the hatchback. Although it shares the same wheelbase as the five-door hatch, the estate is 198mm longer overall at 4556mm. It features full-length aluminium roof rails as standard in every model, while all 1.6-litre petrols and diesels are fitted with engine stop-start. High-tech features available include an automatic parking system, lane-departure warning system, automatic headlights, adaptive cruise control and cameras that can read road signs to remind the driver of speed limits and regulations through the instrument display.